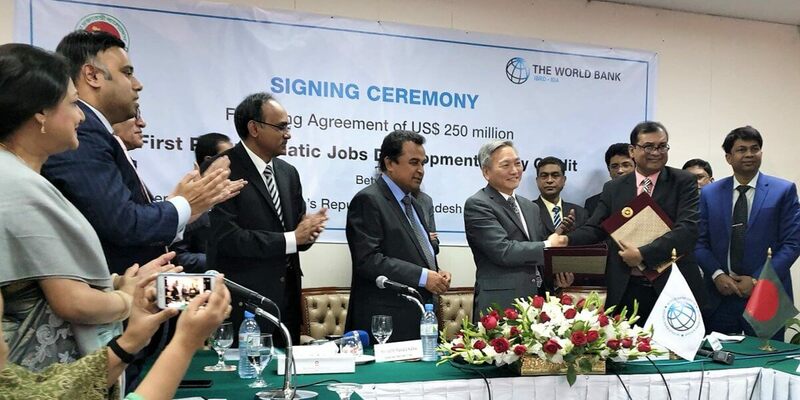 The government of Bangladesh recently signed a development policy worth $250 million with the World Bank aimed at creating large-scale, better-paid jobs. Known as The Programmatic Jobs Development Policy Credit, it is the first initiative of the planned three which will help the women, migrants, and youth of Bangladesh to get better jobs with improved organizational framework. With this policy, social and economic development of Bangladesh is set to receive impetus as it targets the potential of the country’s youth. The integration of this sector of population with adequate skills and good health will pave the way for Bangladesh to harness the maximum potential of its businesses and manufacturing industries. As the youth transforms into semi-skilled and skilled personnel with the help of efforts from the government, they will act as a catalyst in the GDP improvement of Bangladesh. While the youth continues to play their part, the Sheikh Hasina led government has already started preemptive work to bolster the economy, one of which is the recent appointment of Salman F Rahman as the adviser on private industry and investment. Rahman, the founder and vice chairman of Beximco, also served at a similar position of private sector development affairs advisor in some financially boisterous years of the nation. The decision to appoint Salman F Rahman stems from his prior participation in emancipating the business constraints in the country as well as his exposure to the international markets and businesses through Beximco. Considering that, the decision to appoint Rahman could have several positive ramifications for the nation’s businesses and economy. It could further provide a spurt to Bangladesh’s stellar economic performance. Considering all this, the sponsorship by World Bank gives Bangladesh a better image to pitch to international investors and organizations. With the government’s policies and the 7-member advisory council, the development policy could effectively help the government generate jobs and strengthen the market. Apart from youth empowerment, the fund will increase Bangladesh’s ease of doing business quotient and ensure better allocation of investments. The credit timeline is fixed at 30-years with a five-year grace period at an interest rate of 1.25%.